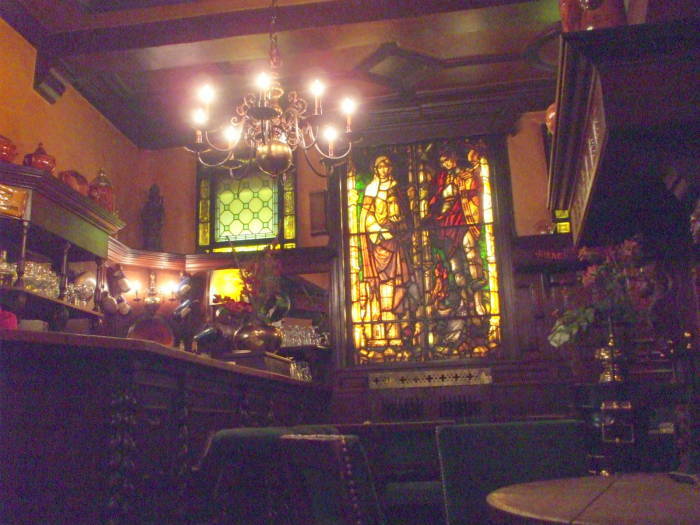 Au Bon Vieux Temps is an old traditional cafe, dating back to 1695. The chimney piece is from the seventeenth century. The stained glass window was originally in the local parish church. 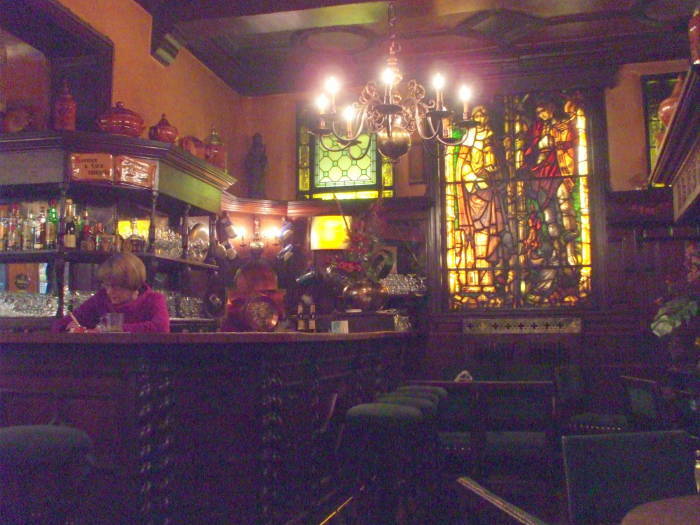 Just after World War II, this cafe became very popular with British servicemen who found it a reminder of their small and older pubs back home in England. There are still some advertising posters for Bass and other British products on the walls, but the focus here is now on Belgian products. Below you see the entry into the impasse from #12, Rue du Marché Aux Herbes. Walk through that arched door and back that narrow passageway. The door into Au Bon Vieux Temps is under the overhang to the right of where the impasse narrows further to pass through a building. Au Bon Vieux Temps is now in the middle of a block. 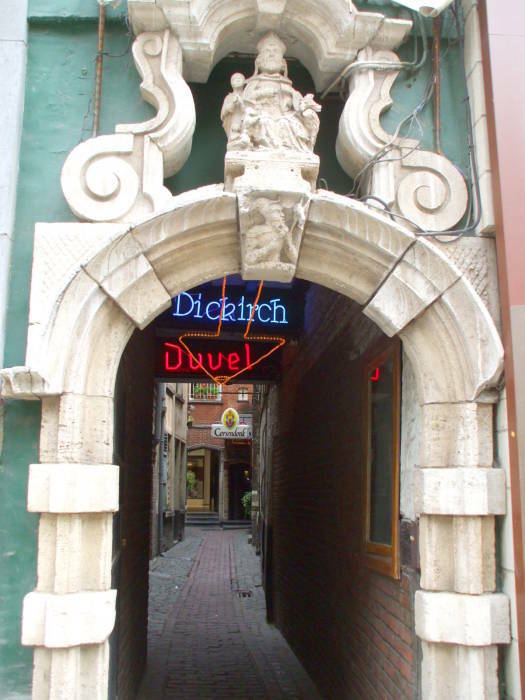 Their address is Impasse St-Nicholas 4, but that impasse is a narrow pedestrian passageway. 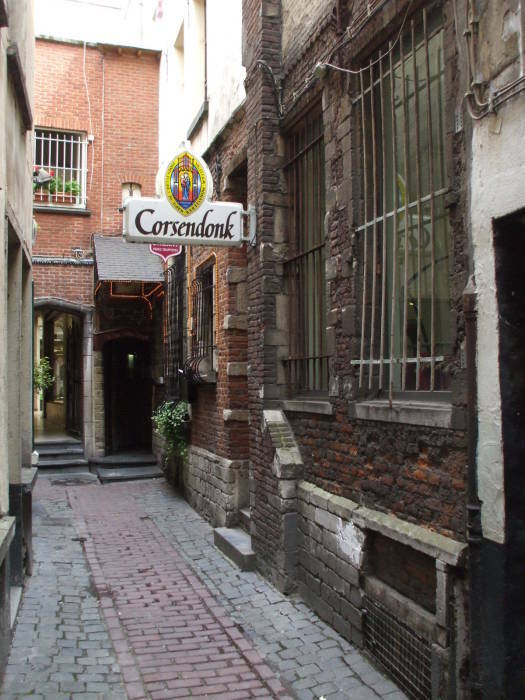 It is off Rue du Marché Aux Herbes 12, just north of the Grand Place. See the map below for the approximate location. There are padded stools at the bar, and small tables. It's a small place, and everything is on a small scale. 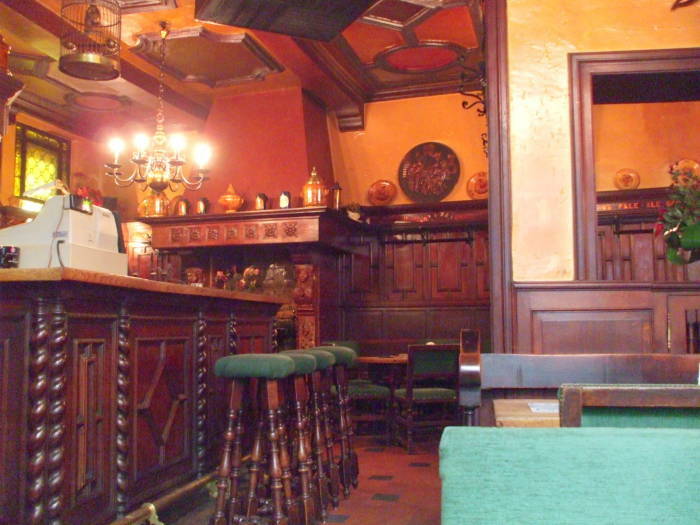 Traditional beers in a traditional setting! This cafe concentrates on Trappist beers. That is, beers produced in a monastery with the involvement of the monks, with the proceeds going to support the monastery or its charity. 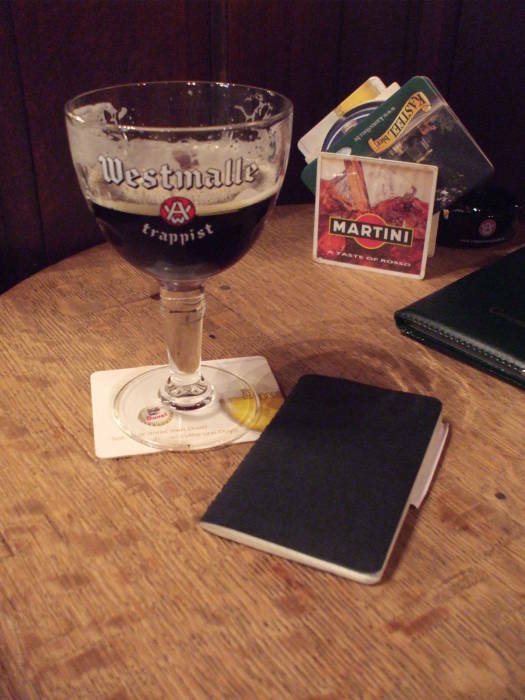 There are only seven certified Trappist breweries in the world, six in Belgium and one in the Netherlands: Bières de Chimay, Brasserie d'Orval, Brasseries de Rochefort, Brouwerij der Trappisten van Westmalle, Brouwerij Westvleteren, and Brouwerij der Sint-Benedictusabdij de Achelse Kluis in Belgium, and Brouwerij de Koningshoeven in the Netherlands. 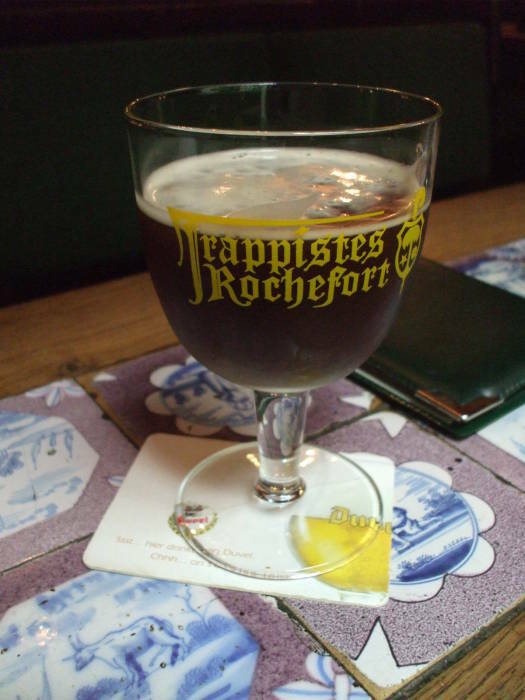 Below is a Rochefort 8 Trappist, brewed in the Abbey of Notre-Dame de Saint-Rémy, close to Namur and Dinant in the Ardennes. 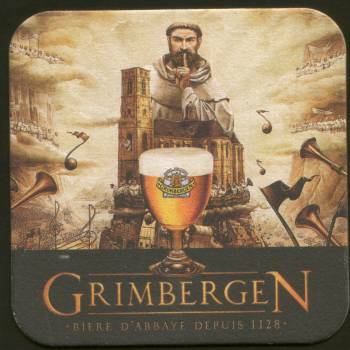 The monks have been brewing beer there since 1595. Also a Westmalle Trappist, brewed at Abdij van Onze-Lieve-Vrouw van het Heilig Hart in Westmalle, Flanders, near Antwerp in the far north of Belgium.